RhB Ge 2/4 1-B-1 electric loco no 221 (SLM, Brown Boveri/1913-1946) at Samedan. This loco was originally no 203 when built in 1913. In 1946 it was converted to have a lower weight, more power and a higher top speed. 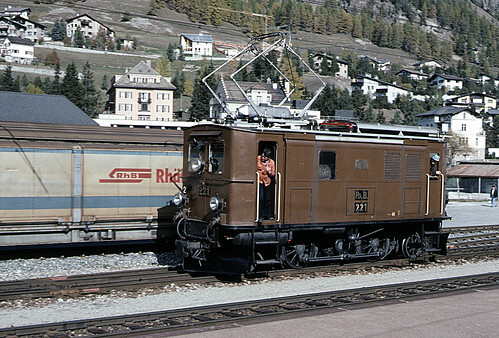 It was withdrawn from service in 1998 and subsequently scrapped. 10/10/1991 [CH 249].